The Panametrics-NDT Microscan transducers are frequently used with the Series 25 and Series 35 thickness gages, as well as other commercially available thickness gages, flaw detectors and ultrasonic instrumentation. When selecting a transducer, please review the chart below or consult the Transducer Frequency Range in the Instruction Manual that was shipped with your gage. One of the advantages of a Panametrics-NDT Microscan contact transducer is its versatility; a single transducer can cover a broad thickness range in many engineering materials. Contact transducers are constructed with the unique WC-5 wearplate for greater durability and a longer life. The Sonopen ® transducer has a replaceable delay line that is tapered to a small contact area. This transducer makes reliable thickness measurements in applications such as turbine blades, threads on plastic bottle necks and tight radii on plastic containers. High-temperature Sonopen delay lines are also available. Panametrics-NDT Microscan delay line transducers provide excellent performance on very thin materials, elevated temperatures or in applications that require a high degree of thickness resolution. Standard delay lines are used in many applications. Special conditions such as high surface temperature, curvature of the material or hard-to-access areas may require the use of special delay lines. * Exact range depends on material sound velocity, transducer frequency, part geometry and surface condition. High temperature delay lines function as a protective buffer between the hot surface of the test piece and the transducer's crystal. At elevated temperatures, intermittent contact is recommended to protect the transducer from thermal damage. Panametrics-NDT Microscan immersion transducers are designed to transmit and receive ultrasound in water. Thickness measurements by immersion technique are often preferred when the test piece has a complex geometry or in online applications. Typical offline applications include wall thickness measurements on small diameter plastic or metal tubing, scanned or rotary measurements and thickness measurements on sharply curved parts. Transducer focusing may be necessary depending on the application. 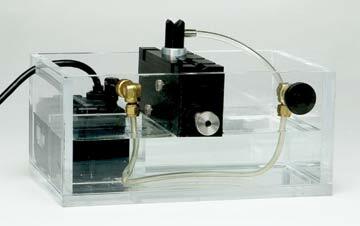 We offer bubblers for easy implementation of immersion testing. They act as a holder for the transducers to maintain consistent water flow from transducer to test surface, and prevent the accumulation of air bubbles on the transducer face. * The B103 has a V-notch shaped opening; the B103A and B103W are flat. Handheld bubbler transducers are available in either 20 MHz (V316B) or 10 MHz (V312B). They are immersion transducers that screw onto a bubbler assembly (B120), which has a replaceable stainless steel tip and a water feed tube. They offer high resolution and easy access inspection of thin materials. Panametrics-NDT RBS-1 immersion tank is designed to simplify ultrasonic thickness measurements using immersion techniques. It consists of a clear acrylic tank, a submersible pump and a transducer fixture in a single, portable unit. It is ideal for offline thickness measurements on metal, glass and plastic products such as small containers, pipe or tubing, sheets or plates or machined parts. (0.06 liter) General purpose, more viscous and has a high acoustic impedence making it the preferred couplant for rough surfaces and highly attenuating materials. (0.06 liter) General purpose, non-corrosive, does not evaporate and is insoluble in water. (0.35 liter) Rough surfaces such as sand-cast metals and fiberglass layups. Weld inspections, overhead surfaces or vertical walls. (0.06 liter) 0 to 600 °F (-12 to 315 °C) easy removal at high temperatures, non-toxic and biodegradable. (0.12 liter) Normal Incidence Shear Wave, non-toxic, water soluble organic substance of very high viscosity. (3.78 liter) Bulk couplant: Customize the viscosity by adding different amounts of water. Temperature range for this couplant is 32 to 130 °F (0 to 54 °C). Can be winterized by mixing with windshield washer fluid. Test blocks are necessary for the calibration of ultrasonic thickness gages and should be used to maintain and verify the accuracy, dependability and reliability of ultrasonic measurements. Blocks are held to tighter tolerances than called out in ASTM E797 code. Metric test blocks are available. Olympus-NDT offers a wide selection of transducer cables suitable for all ultrasonic thickness gaging instrumentation. Standard cables are recommended for normal usage. Heavy duty, Teflon ® (HD) transducer cables may provide durability and longer life. Waterproof (W) cables are recommended in many tests with immersion transducers. These cables provide a waterproof connection good to about 30 ft (10 m) of fresh water. At greater depths, special cables are available. Heavy duty, armored PVC jacket (HDAP) transducer cables have a spiral stainless steel jacket with a solid PVC coating. Maximum length is 20 ft (7 m). Heavy duty, armored super flexible silicone jacket (HDAS) transducer cables combine a spiral stainless steel jacket with a heavy silicone coating for great flexibility. Length can be specified up to 20 ft (7 m). Heavy duty, armored stainless steel jacket (SSA) transducer cables are recommended for heavy and industrial use provide flexibility, protection and long life.